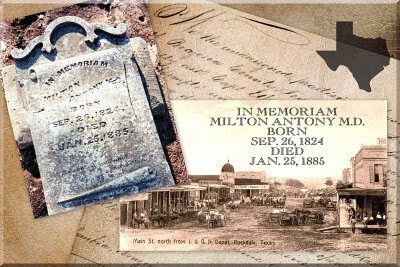 BeNotForgot.com: 1885 :: Death of Milton Antony M.D. What an amazing description of the town! My goodness! Thanks for stopping by, Beth & Lori -- we have a loonnngggg history in this area. This is my hometown, full of oodles & oodles of my kith & kin, with roots in the area before Rockdale even became Rockdale in 1874. In reading about that time period, I have actually had several encounters with some form of the word "pettifoggeries" -- neat word! The way you tell the story is very interesting. The icing on the cake is the artistic way you format your blog. The collage is great, eye catching ---- and makes me envious of your ability. I also like the way you use spacing, fonts and formatting. Very, very nice. I have such a long way to go to understanding how to do such lovely things that makes your stories even better. Thanks.